Heavy rains continued to drench Windsor and Essex County in southwestern Ontario Tuesday following a record rainfall Monday night that flooded streets and basements and temporarily closed some businesses. Vehicles negotiate a flooded street in east Windsor on Tuesday. 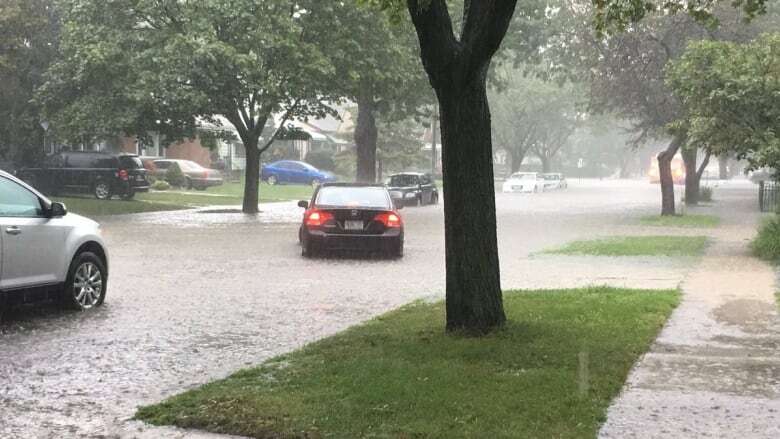 Heavy rains continued to drench Windsor and Essex County in southwestern Ontario Tuesday following a record rainfall Monday night that flooded streets and basements and temporarily closed businesses. Between 80 and 150 millimetres of rain doused the Windsor area between noon and 4 p.m. ET Tuesday and an additional 50 millimetres is in the forecast, Environment Canada said in a bulletin warning of flash floods and pooling water on roads. On Monday night, Windsor's airport recorded rainfall of 57.4 millimetres, shattering the old record of 43.2 mm on Aug. 28, 1961. Volunteers in the Tecumseh area reported rain totals of 129 mm Monday and a volunteer southwest of Windsor recorded total rainfall of 140.5 mm, said Environment Canada. The bulk of Monday's rain swept through a swath of the county stretching from McGregor and heading northeast toward the area between Tecumseh and Belle River, the weather agency said. Windsor was hit too, and by 2 p.m. Tuesday the city's 311 call centre had fielded 105 calls from residents reporting "varying degrees of water infiltration in their basement." Shortly before 4 p.m. Devonshire Mall closed for the day, citing drainage problems. Lakeshore Mayor Tom Bain said his town had received about 160 flood-related calls, including calls from people who were flooded out just 11 months ago. Last September, the mayors of Windsor and Tecumseh declared a state of emergency for their communities after massive flooding hit the region. Bain said residents expressed frustration with the double dousing but that municipal systems aren't built to withstand these types of exceptional storms. From September: Flooding leads to state of emergency in Windsor, Tecumseh, Ont. On Tuesday morning, a flood warning was issued by the Essex Region Conservation Authority, which said water was flowing over roads across the region due to overwhelmed drainage infrastructure. "The areas most significantly impacted are roadways within the town of Lakeshore, west of Belle River, the existing older portions of the Town of Tecumseh, and isolated areas in the city of Windsor." Restoration company Parker DKI has been fielding calls to rip up and restore basements in Windsor — and some of them are repeat customers. "We finished this job around April," said Jim Parker, watching his crew rip laminate floor boards out of a basement on Riverside Drive East. "That was from September." Parker said the house had about 76 to 100 mm of water in it after Monday night's rain. He said it's expected it will cost thousands of dollars to fix, but added that number is on the low side for some of the houses his crew has visited. The basement of Darren Demers's Papineau Court home flooded last September and again Monday night. He made the decision last year to keep his basement unfinished for fear flooding might happen again. "I was upset at first but what are you going to do," he said outside his home late Monday night. "I knew it was going to happen again. It's bound to happen again." Monday's storms were more intense than last September's, though there was less rainfall in total. Tecumseh, the hardest hit area, was soaked with between 100 and 120 mm in four or five hours. Last September, Tecumseh was slammed with 175 to 200 mm over a longer period.